The United States of America is one of some countries that celebrate an annual Armed Forces Day. The third Saturday in May is celebrated as the US Armed Forces Day every year. This day was created on August 31, 1949 and first ever celebration was on May 20, 1950. President Harry S. Truman was instrumental in establishing this day to thank the military and their families for their services. The US Department of Defence is the biggest employer of the Unites States with 2.3 million people serving sand 1.8 million people on active duty. They own nearly 30 million acres of land worldwide and are the single largest consumer of energy. The longest running official Armed Forces Day Parade is in Washington. 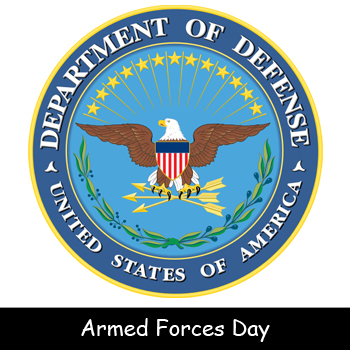 Armed Forces day was originally meant to replace separate Army, Navy, Marine Corps and Air Force Day. 31 of the 45 presidents have served in the military. President Theodore Roosevelt earned the Medal of Honor, the highest honor in the military. Many events take place across the US on Armed Forces Day to honor military personnel. The theme for the very first Armed Forces Day celebration was ‘Teamed for Defence’. B-36 bombers flew over the capitals of every US state during the first Armed Forces Day celebration. President John F. Kennedy made this a national holiday by issuing Proclamation 3399 on March 18, 1961. It is a tradition to fly the American flag on this day’s celebration. Different military exercises are held at sea, in the air and on land on this day. It is a way to show the civilian their state-of-the-art equipment. Various activities on this day include parades, receptions, air shows etc. Declan, Tobin. " Fun Facts about Armed Forces Day for Kids ." Easy Science for Kids, Apr 2019. Web. 21 Apr 2019. < https://easyscienceforkids.com/armed-forces-day/ >.